Meet WPS Park & Recharge; the first charging station for electric cars integrated with a parking management solution. 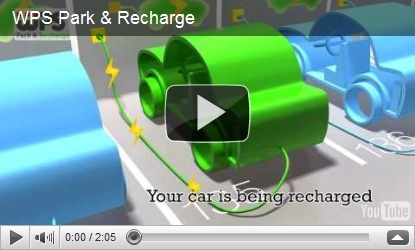 The most unique feature of the WPS Park & Recharge solution is the use of a Smart Grid. Using an intelligent energy infrastructure, the WPS Park & Recharge solution distributesthe required energy to the different charging stations based on capacity. This feature makes sure that the palring facility power grid will not be overcharged, even when all charging stations are used at the same time. Because of the complete integration between the WPS parking management solution and the WPS Park & Recharge solution no separate payment facility is needed. By making use of the (existing) payment infrastructure of the parking management system, payment of both parking and recharging can be combined. Whether you are a short-term parker or a subscriber, one payment is sufficient for both services. A clear and separated overview of the cost related to both parking and recharging is provided via the receipt (for short-term parkers) or the monthly invoice (for subscribers). The WPS Park & Recharge solution is easily extendible. Each central unit can support up to twenty charging stations. All central units can work together and are manageable as one single integrated system. This makes the WPS Park & Recharge solution the answer to the growing need for electric charging stations in the future.